I'm sure a similar thread exists somewhere but I really wanted to post this picture. 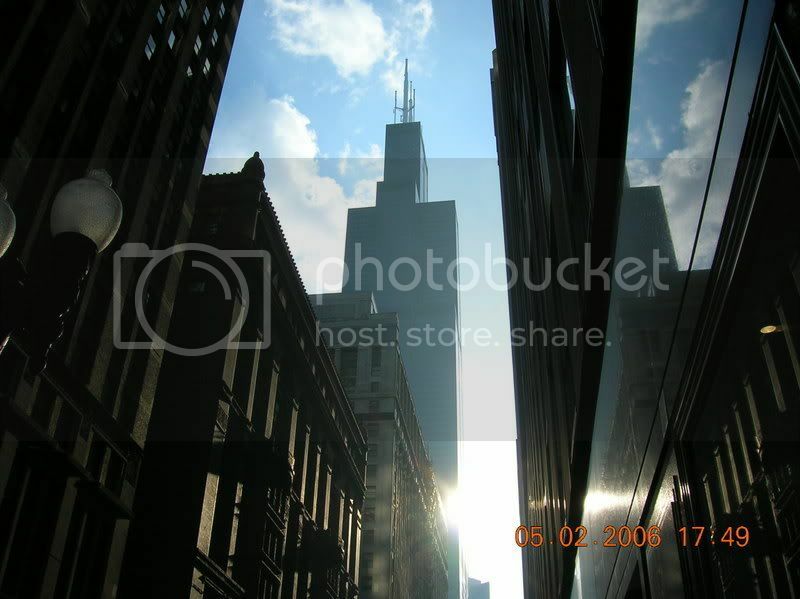 The Sears tower is an awsome building. I remember being in Chicago on a cloudy day and seeing half of the building obscured in clouds. That same day I was in the Skydeck of the Sears Tower. I was dissapointed because being inside a cloud block the wonderful views I would have seen. But being inside a cloud blew me away too as the clouds made all the windows look like a continuous wall of flouresent lights. 103 stories up that was a awesome view. Chicago is a awesome city. That is a cool pic. Great pic and it looks like you had a perfect day to check it out buy the sunny & blue skies. What's the cost to go to the viewing deck for the Sears Tower? Does anyone have any photos from the top of the Sears Tower viewing deck? I have a ton, but personally I think the Sears tower observation deck is wack. I go to Chicago about once a month, sometimes every other month, and we always go up into one of the towers, either to the JHO, or Sears. 6. They got pissed at us once for bring food up there. 2. Nice views of ALL of Chicago's highrises. What I mean is if you take 1 picture, you can maximize the number of tall buildings from that location. 1. A few times, the windows were dirty. 2. $5.00 Cheaper. Walk in with a blank 8.5 x 11" piece of paper and you might get in free! 6. You can go outside! 7. You can bring food up, and eat it up there. The reason why I bring this up, is b/c we go up there after dinner, and we usually order dessert but have it boxed. For some reason, the experience in the JHO is better. No crying babies, waiting in lines. It feels less touristy, and more welcoming and relaxed. About the blank paper, are you serious?